GRAFENWOEHR, Germany — Every first Friday of a month, a bus tour takes place around U.S. Army Garrison Bavaria installations to show newcomers the most important locations on and off post. 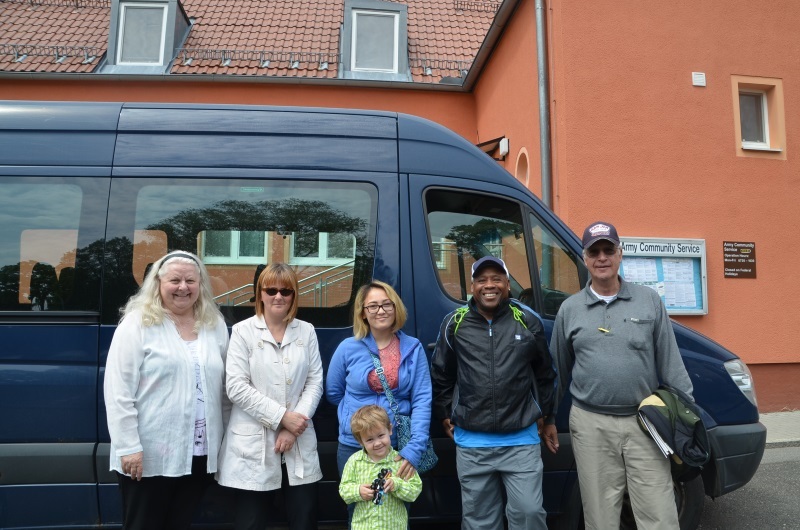 Army Community Service organizes the Windshield Tours to help Soldiers and their families orientate to Tower and Rose Barracks and acquaint them with life in Bavaria. The Windshield Tours are part of the Relocation Readiness Program and the Discover Bavaria Passport Program. Participants can start the tour on both Tower and Rose Barracks where the bus stops in different locations to pick them up. Once newcomers get on the bus, the tour takes them to resources and service locations on post. Tour stops include the fitness center, Wild B.O.A.R. Outdoor Recreation and the United Service Organizations where staff explains what is offered and answers the newcomers’ questions about their activities. At USO, participants are also invited to have lunch. Apart from helping the newcomers find their way around on post, the tour also takes them off post into a German supermarket to provide them with knowledge about grocery shopping in Germany. The tours are guided by Ursula Schneider-Lucaner, a German and retired military spouse who knows German culture just as well as the details of moving overseas. According to Roswitha Ebnet, Relocation Readiness Program manager at ACS, the target audience is mainly military spouses. “The Soldiers coming to USAG Bavaria already have connections because they have coworkers and are integrated in their workplace, but the spouses often have nobody,” Ebnet said. Ebnet has often heard that spouses are scared to go off post. With the Windshield Tours, ACS wants to show them that there is nothing to be scared of. 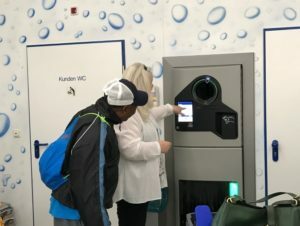 Cultural host and tour guide Ursula Schneider-Lucaner explains the functions of a deposit bottle automat to a Windshield Tour participant. The ACS tours show newcomers to USAG Bavaria important locations on post and provides them with knowledge about grocery shopping in German supermarkets. The Windshield Tours are designed to get such problems out of the way from the start. For Cassandra Kirk, a spouse who just moved to Bavaria with her husband and children, this goal was achieved. Although the Windshield Tours are advertised for newcomers, everybody who is interested is welcome to participate, not only spouses. “ACS is here for everybody,” Ebnet said. The Windshield Tour takes place every first Friday of a month from 9 a.m. to 2 p.m. They are worth one stamp in the Discover Bavaria Passport. For more information and to sign up for the next tour, contact ACS Tower Barracks DSN 475-8371, CIV 09641-83-8371 or ACS Rose Barracks DSN 476-2650, CIV 09662-83-2650. If you want to participate, please sign up at least two days prior to the next tour.